Woman in yoga position Salamba Sarvangasana , length 22 cm. Material: resin, bronze patina with blue accents. Comes in a giftbox. Woman in yoga position Eka pada Rajahapitasana, length 13 cm. Material: resin, finished with a bronze patina with blue accents. Comes in a giftbox. 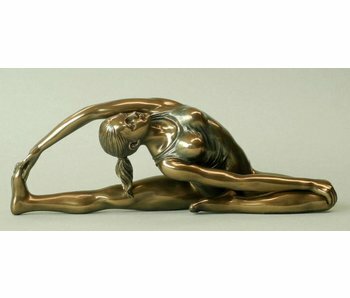 Woman in yoga position Vrischikasana, length 14 cm. Material: resin, bronze patina with blue accents. Comes in a giftbox. 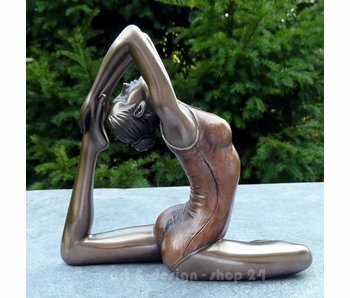 Woman in yoga position Utthia Trikonasana , length15 cm. Material: resin, bronze patina with blue accents. Comes in a giftbox. Young woman in yoga position Pariurtta Janu Sirsana, length 7 cm. Resin, finished with a bronze patina. Comes in a representative giftbox.